Delicious in any beef or lamb recipe but lower in fat, cholesterol and calories (250g). 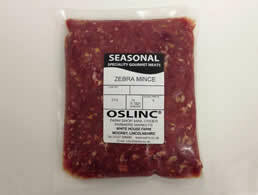 Make your mince recipe a little exotic with our lean Zebra mince. Supplied vacuum packed and suitable for home freezing.